There’s an old saying that is often quoted. “Let food be thy medicine and medicine be thy food.” Who uttered such wise words? Why, it was Hippocrates; the man who is known as the father of modern medicine. We’ve come a long way from there, though; haven’t we? As a society, we eat foods that harm our bodies instead of heal them, and then we pop unnatural pills to make ourselves feel better. It’s a vicious cycle. Fortunately, it’s one that’s easy to break. Well, in theory. It’s all about breaking bad habits. It’s about making healthier choices. And there are some choices that are healthier than others. Some foods have such powerful healing abilities that they can almost be used as medicine. Try adding a serving of one of these “medicinal” foods three times daily. Steamed kale – Actually, many cruciferous veggies, such as kale, collard greens and mustard greens, contain high levels of a compound that binds to bile in the stomach and helps remove it from the body. Bile is used by the body to create cholesterol, so less bile; less cholesterol. In fact, some medicines are designed to do exactly what that sautéed kale does. Kale has also been studied for a potential role in cancer prevention. Kale for dinner? Click here for recipe. Dark chicken meat – This one may surprise you, but it’s the dark meat of the chicken that has been shown to reduce the risk of fatal heart disease. A study done by researchers at the New York University School of Medicine found that a compound in dark meat (called taurine) significantly lowered the risk of coronary heart disease in women with high cholesterol. Persimmon – Have you ever heard of this fruit? They’re not so popular in the US, so they can be hard to get, but the hunt is worthwhile. The fruit itself is sweet, but the skin is quite bitter, so you just have to peel before eating. A persimmon is actually even higher in fiber, minerals and phenolic acid than an apple. And these are all things that contribute to heart health. So, if you can get your hands on them, go for a persimmon a day to keep the doctor away. 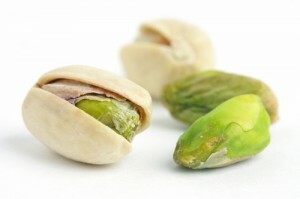 Pistachios – Pistachios are rich in a compound called lutein, which plays a role in reducing cholesterol. They’re also high in fat, so don’t overindulge if you’re watching your waistline. Deborah Enos, Certified Nutritionist, also known as “The One-Minute Wellness Coach”, is one of the most popular wellness coaches on the West Coast. Her blog, “Health in a Hurry”, is quickly becoming the weekly must-read for busy people who want to learn to improve their health in just 60 seconds. Visit http://www.deborahenos.com for details.